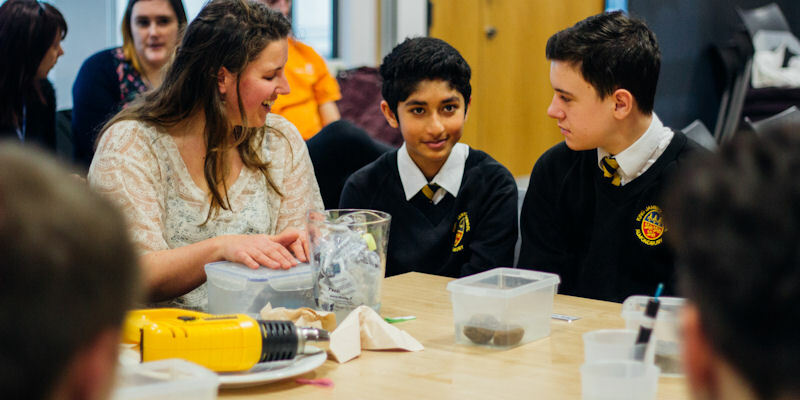 The Faculty of Environment has a variety of outreach activities available for pupils of all ages, in topics relating to human and physical geography, geology, environmental science and sustainability. In addition to running a programme of larger events throughout the year, we also try to accommodate requests for visits, talks and workshops from individual schools. Enthusiastic university students are great role models. If you’d like to help your students make sense of the many degree options available to students interested in Geography, Geology, Environmental and Climate Science or Sustainability, why not invite one of our student ambassadors to come and speak with them face-to-face? Our specially trained student ambassadors talk about their experience at university, and why they chose to study their subject. For more information contact Pre Carbo. There is also the option to have greater input from final year undergraduates by offering a placement to a student on one of the ‘Into Schools’ modules. The placement student would spend from 20 to 60 hours in the classroom, and develop and deliver learning resources with your guidance. Take part in a fossil hunt in your school, with our expert palaeontologists. What did these strange creatures look like when they were alive? Where did they live? What did they eat? This fun and informative workshop is for years 3 to 6 and only for schools in the Leeds area. For more information contact Pre Carbo. Learn the techniques of earthquake location using real data from the seismic monitoring network based at Leeds. This can be run with AS or A2 geology or physics groups or for key stage 4 and 5. We bring all the materials – you just need to provide pencils, rulers and pairs of compasses. The Festival schools programme is full of exciting STEM events for key stage 2 to 5, involving science, maths, engineering and geography. Our programme offers a selection of ‘roadshow’ sessions which can be brought into school. See the website for more information. Our popular 'Leeds Rocks' petrology practical, which takes place in our state-of-the-art Earth Visualization laboratory, is an interactive workshop that tackles parts of the A level syllabus which can be difficult to cover in a classroom. Students learn the basic skills of thin section analysis using our dedicated microscope teaching suite. This is available for key stage 3 to 5. Group sizes can be from 1 to 96 students. A simpler version of this workshop is also available for key stage 3 and 4. Please contact Phil Murphy for further details. A taster day that gives your students the opportunity to find out about this exciting area of study through inspiring science sessions, and meet staff and students from the programme. The event is ideal for those studying related subjects such as Geography or Biology. Please note: Applicants should be studying at least one science subject at A level. Students can attend independently, or in a school group. Find out more. The Festival of Science is full of exciting STEM events for key stage 2 to 5, involving science, maths, engineering and geography. Our programme offers a selection of ‘on campus’ events. See the website for more information. The Faculty of Environment holds an annual teachers’ conference, in which we bring together some of our top academics to share insights into their latest cutting edge research. The event is FREE, with lunch and refreshments included. The next conference will take place in 2019. The aim of this course is to give primary school teachers with no previous experience of Earth Science the opportunity and materials to familiarise themselves with this fascinating subject, and to incorporate it into their teaching. The course will include a short introduction to Earth Science, covering concepts such as the geological timescale and the structure of the Earth; a practical session on rocks and minerals; and an interactive session on fossils and the history of life on Earth. Each teacher will receive a set of replica fossils and a set of rock specimens, together with a poster-sized geological map of the UK to take away and use for activities within their school. For more information contact Pre Carbo. Support teaching in the classroom and in the field by providing high quality geographical teaching and learning resources.